PowerGREP consists of nine panels that you can arrange in any way you want. You can dock panes side by side, arrange them in tabs, or make them float. Adjust PowerGREP to the way you like to work. 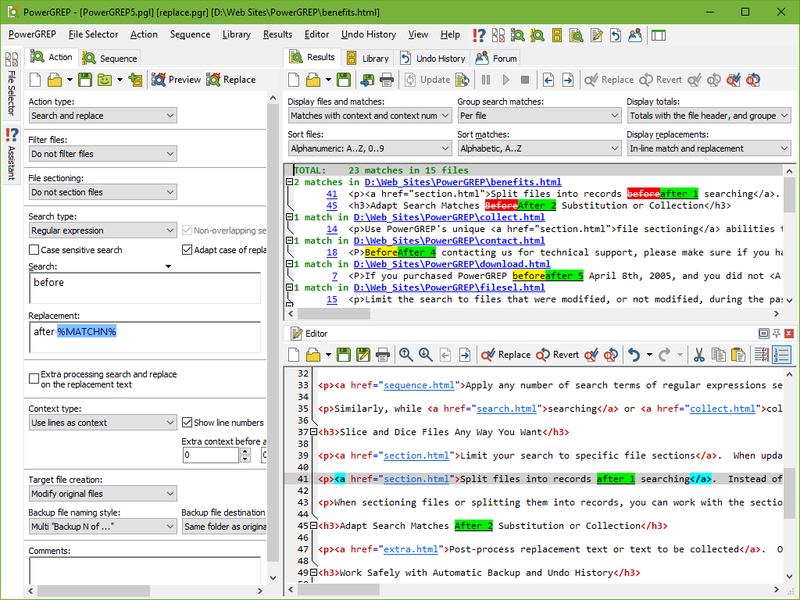 PowerGREP comes with several pre-arranged layouts for regular and widescreen monitors, as well as dual monitor computers. The screen shots below have been kept small to make them easier to put on this web site. They also have most panels arranged side by side, to make them visible in the screen shot. This makes the layout a bit cramped. In practice, you'll either use a tabbed layout on a small screen, or a side by side layout on a large screen, making PowerGREP much more usable. In the above screen shot, I searched through all HTML files in the folder d:\Web Sites\PowerGREP. I used one regular expression to limit the search to HTML anchor tags, and another to find all email addresses in the anchors. 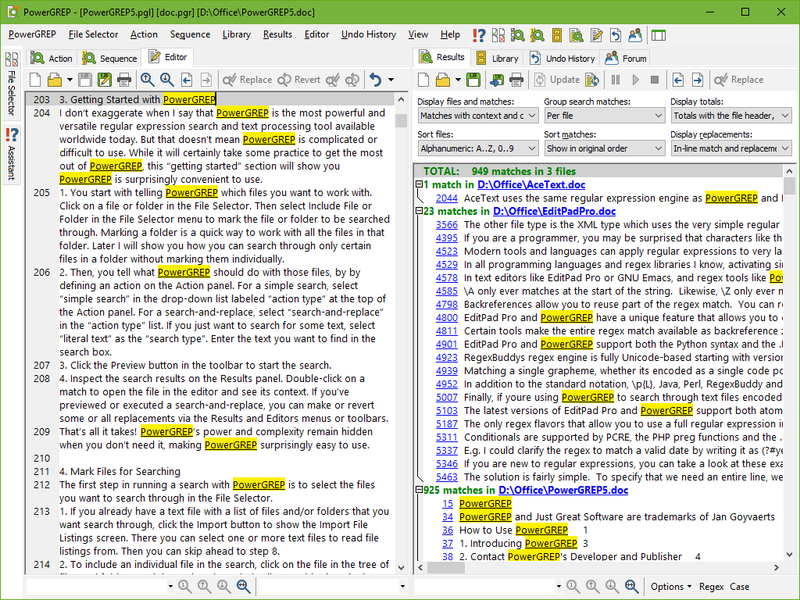 This screen shot shows a preview of a search-and-replace. 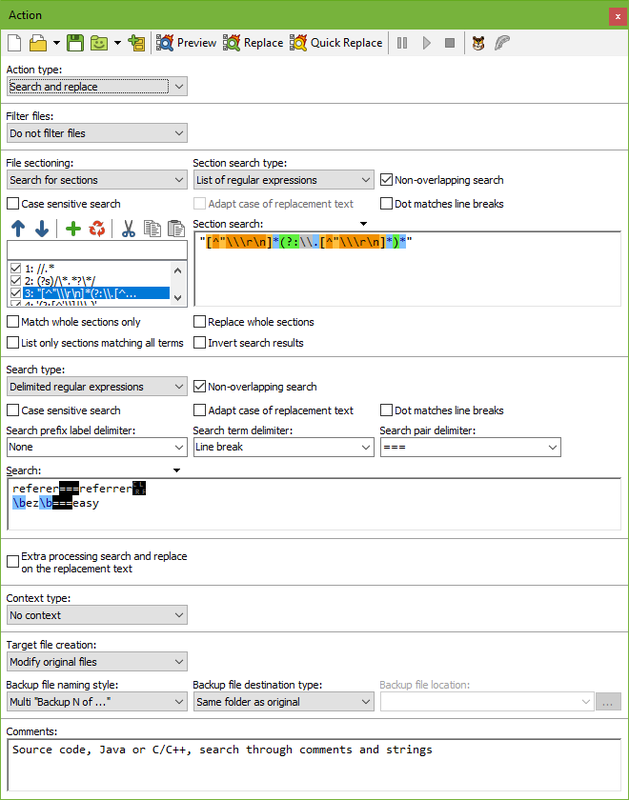 The action specifies to replace the word "before" with the word "after" followed by the number of the search match across all files, with the option to maintain the word's capitalization. I opened the first file in the results and clicked a button to actually replace all the matches in that file. The different colors on the Results panel indicates which replacements were actually made, and which have only been previewed. Instead of blocking the operation with a yes/no prompt for each replacement as many search-and-replace tools do, PowerGREP gives you a complete list of replacements to be made. You can make or revert individual replacements or all replacements in a particular file, in any order that you like, with full undo ability. You can also make or revert all replacements at once. This image shows the results of "Inspect Apache web logs - Google search terms" example action included with PowerGREP. The regular expression, which is clearly explained in the help file, matches one line in an Apache web log file of which the referring URL is a Google search page. We collected "\2", which is whatever is matched between the second pair of parenthesis in the regular expression. In this case, the search terms embedded in the Google referring URL extracted from the web logs. Extra processing is used to convert URL-encoded characters back to normal characters. The above screen shot also shows that PowerGREP enables you to work with archives created with WinZIP, 7-zip and many other compression tools as if they were regular file folders. PowerGREP decompresses files inside archives on-the-fly. Web logs typically take up only 5% to 10% of their usual space when compressed with 7-zip or WinZIP. Compressing them frees up lots of disk space and with PowerGREP you can still search through them. Thanks to PowerGREP's flexible backup options, I can still fully undo this action until I decide to delete the backup files. I can easily do so in an instant on the Undo History page. In the above screen shot, I searched for the word "PowerGREP" through a bunch of PDF files. 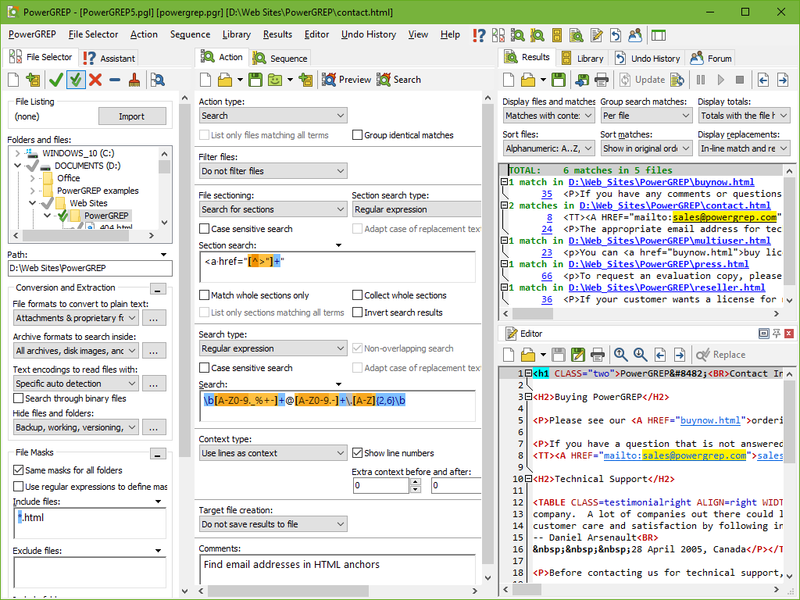 The results and file editor in the above screen shot show the file PowerGREP4.pdf. This is PowerGREP's printable manual that is included with the PowerGREP software itself. In the above screen shot, I searched for the word "PowerGREP" through a bunch of MS Word documents. 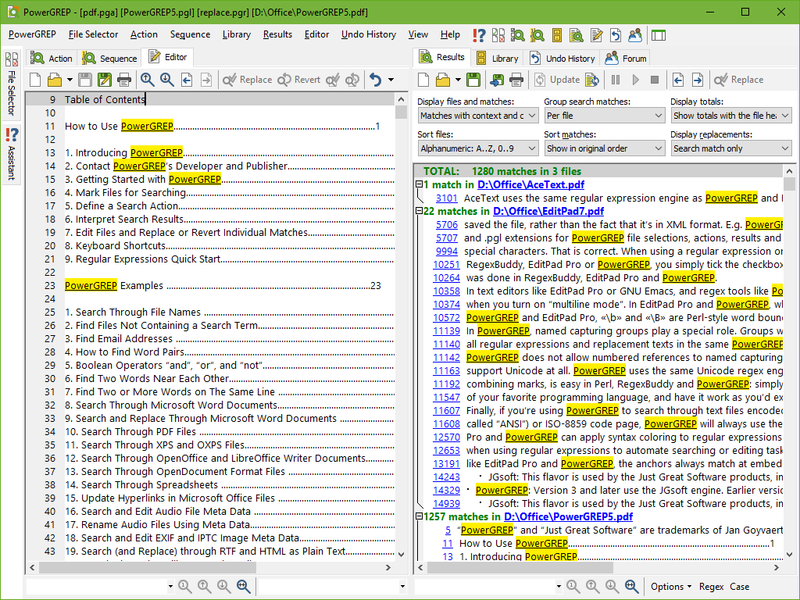 The results and file editor in the above screen shot show the file PowerGREP.doc that served as the basis for PowerGREP's printable manual that is included in PDF format with the PowerGREP software itself. In the above screen shot, I searched for the word "PowerGREP" through a bunch of Excel spreadsheets. You can see the search results. 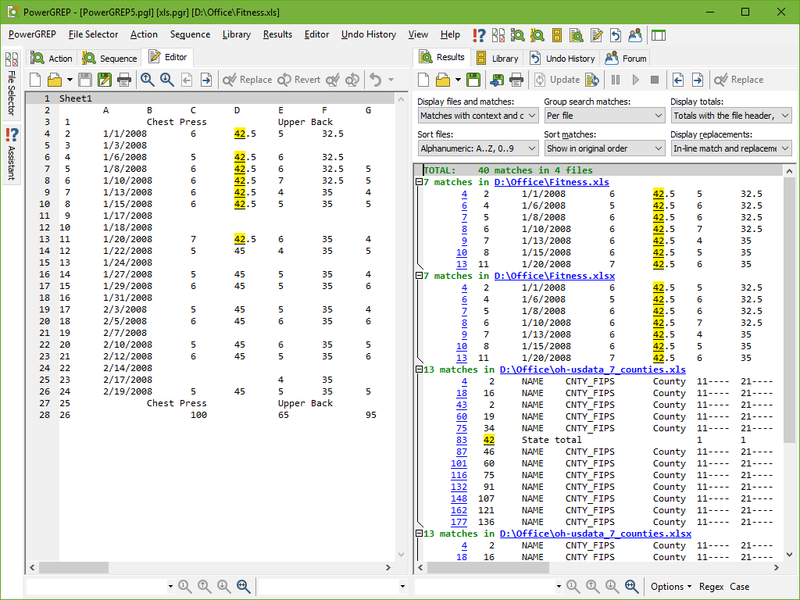 I opened the file Fitness.xls in PowerGREP's built-in file editor, which displays the spreadsheet as plain text. 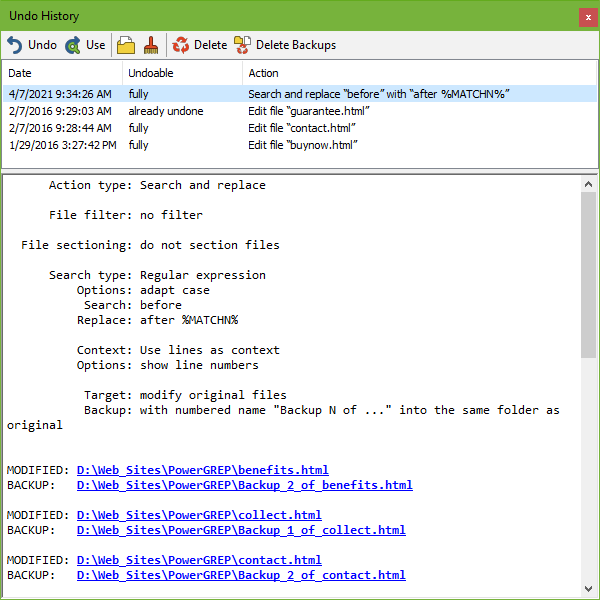 PowerGREP enables you to work with binary files just as easily as with plain text files. You can search for a text string or for a sequence of bytes that you can enter in hexadecimal mode. 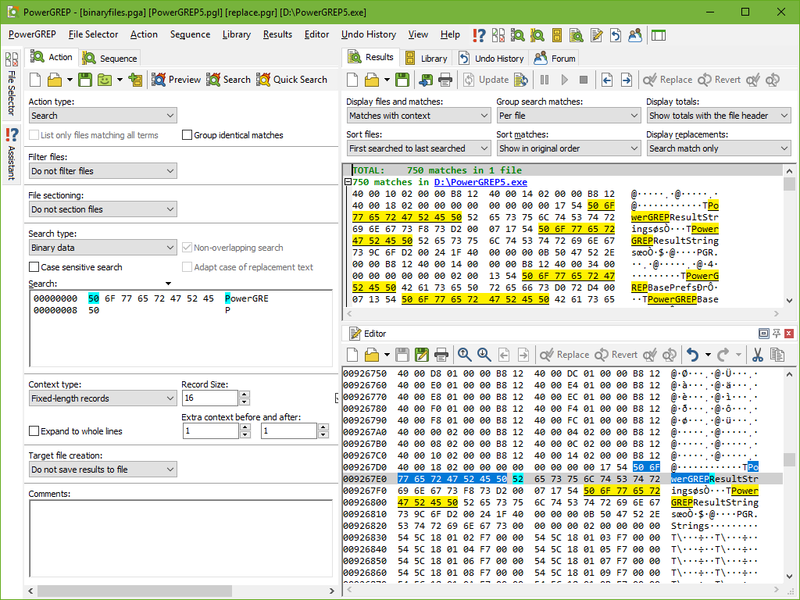 The results and editor will show the file's contents in hexadecimal and textual representation, just like a hex editor would do. Most grep tools can only search for a single regular expression. 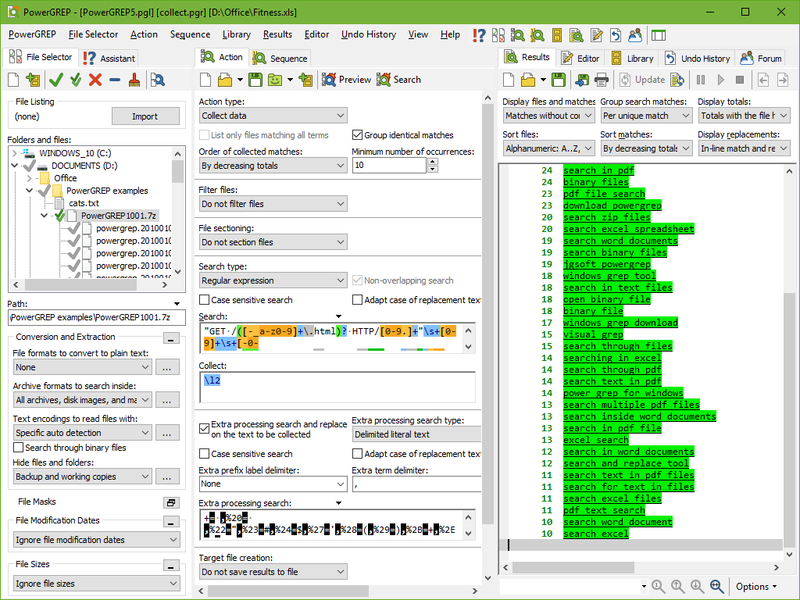 With PowerGREP you can use as many regular expressions or literal search terms as you want. In the screen shot, I'm performing two substitutions at once, searching only through comments and strings in Java and C++ source code files (as opposed to the entire files).